Select from four popular dual control Cb echo boards. LT2N, TRB1 Turbo or TRB2 Turbo. 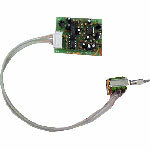 Installation available with a Cb radio purchase. For mobile Cb radios only, like Galaxy, Cobra, Ranger, Uniden and others. Echo boards will not fit in some small radios. If you are buying a radio from us you can select your echo board from the radios "View Detail" page. LT2-D Echo Board: (Discontinued) Clearest sound with shorter echo. Similar to the old style "Connex" echo. We recommend this one if you like the old style crispy-clear sound. *Installation available with radio purchase - See the options on the detail page of the radio you want. If there is no echo option for that radio then it either comes with echo already or echo installation is not avaiable for that radio. *Gives your radio a loud clear sound, reverb, or echo sound. The TRB 1 and TRB 2 echo boards also have a robot and alien type sound effect. When adjusted to the proper setting with our modulation upgrade or tuning you will get a very loud, crisp and clear sound. *The design of some radios does not allow for the controls to be mounted on the front. In this case they can be mounted on the side, top or bottom. The location is up to you. (applies to: Galaxy Dx919, 929, 939, 949, 959, 979, Cobra 29LX). *Our $40 modulation upgrade (tuning included) or $30 tuning is recomended for a crisp loud and clear sound. Tuning the radio will also make the talk-back much louder and clearer. *Top it off with an Astatic 636L or RK56 Noise canceling mic, for that perfect sound you are looking for. *Installation instructions are not included with all echo boards. You can find instructions on-line. *WARRANTY NOTE: There is NO WARRANTY at all if you install it yourself. It is very easy to blow the echo board or the radio with the slightest mistake. NO RETURNS on echo boards.